Did you miss last night’s game? Because even though it was against the struggling Tampa Bay Rays, it was extremely important. Let me paint a picture for you: Top of the ninth inning, game tied at one run apiece. Two outs. Brett Gardner had already scored the tying run and A-Rod and McCann were anxiously perched on second and first, respectively. Slade Heathcott, called up just a few days earlier, comes in for Rico Noel, who pinch-ran for Beltran earlier in the game. First pitch, Heathcott slugs a Brad Boxberger fastball into the left field seats. But that wasn’t why the game was so important. The hit was amazing, but the reaction from the dugout was far more important. A-Rod pranced around like a child discovering he’s going to Disney World, not the 40-year-old ballplayer he is. 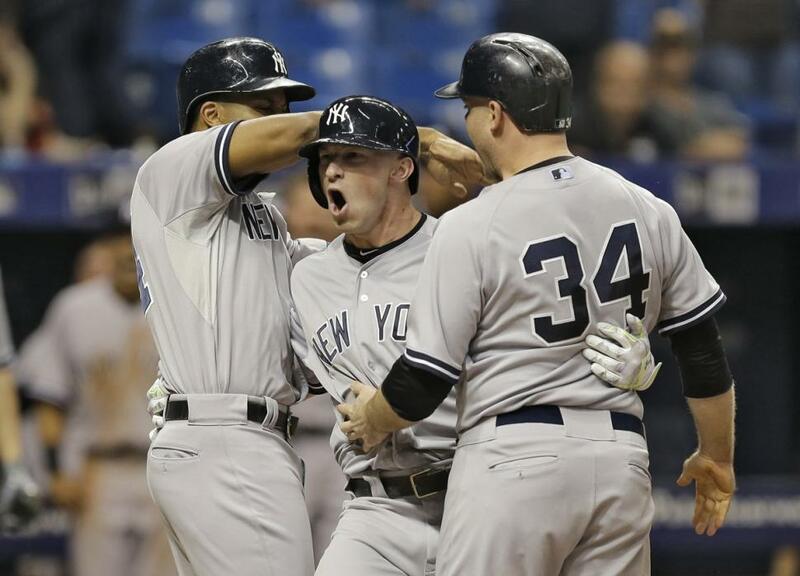 Brett Gardner yelled and pumped his fist. Chase Headley emerged from the dugout, ready to mob Heathcott as he rounded the bases. Even Tanaka, the normally expressionless ace, screamed and yelled with joy. Heathcott, rounding first, erupted in a series of fist pumps and yells. When he got to the dugout, the celebration continued far after the ball left the ballpark, with A-Rod picking him up, high fives being exchanged all around and chants of “let’s go!” being echoed from player to player. A win is great (and much-needed, at this point in the season), but the raw emotion and celebration from that erupted from the dugout was the most important piece. That was the most excited that dugout has been this year. The Yankees, generally stone-faced after a victory, actually smiled real smiles after the homer. All of this season’s woes and heartbreak culminated into this one game, this one moment, to revitalize a tired and aging Yankees’ squad. It was pure and raw and, ultimately, a relief to see so many Yankees so excited about a hard-earned victory. And having a young rookie in Heathcott, who has battled so much so far in his young career, as the catalyst sparked this fire in the Yankees. Overcoming problems with alcohol addiction and injuries that kept him from his time up in the majors, Heathcott finally got his chance to prove himself…and he did. Better yet? He sparked the fire of competition and love of the game. This celebration was a reminder to an aging team why they started playing this game in the first place. Slade Heathcott may have earned his long-awaited pinstripes last night, but the Yankees also earned a sense of rejuvenation going into the thick of the playoff hunt. You know those posts from the MLB that claim “THIS” to represent the pure joy and love of baseball? Well THIS is baseball. THIS is what it is all about.